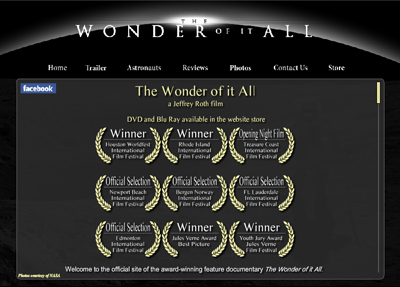 A Film about the 7 men who walked on the moon. This site features a movie trailer and an e-commerce store. As well as beautiful shots captured by the moonwalkers themselves for backgrounds. Technologies used: Photoshop, Audio editing, Flash, XHTML, PHP, Complete Slideshow Image Gallery, Flash video.